How do I switch to Mac Mode? Tap the layout key once to load Layout 2, the Mac Layout, to the keyboard. The right Layout LED is illuminated when Layout 2 is active. How do I reset my keyboard to the default layout and/or settings? Press Program + Shift then tap F12 (lights flash) to reset the active layout file by erasing all remaps and macros and restoring it to Windows mode. 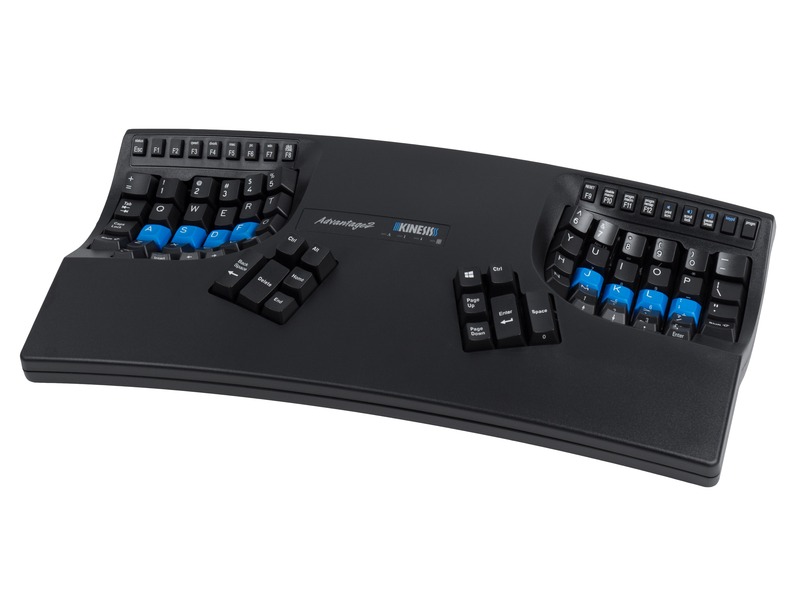 Press and hold Program + F12 while plugging the keyboard in (hold until the lights flash and release) to erase all remaps and macros from all nine layouts and reset keyboard settings to the factory default. How do I remap a key? You can remap a key using the onboard shortcut or the SmartSet App. Tap the Remap key (light will begin flashing rapidly). Tap the “source” key action you want to copy (light will slow down). Note: Remapping is a one-way process, to swap key actions you must perform two separate remap actions. Open the v-Drive (SmartSet + F8). Navigate to the “FS Pro” removable drive in File Explorer and launch either Windows or Mac version of the App. Select the desired key in App and either tap the key action on the keyboard or select from a list of Special Actions using the button at the top of the Programming menu. A macro is a sequence of key strokes that can be stored in your keyboard and played back with click of a single trigger key or key combination. You can record a macro on-the-fly using the onboard shortcut and assign it to any key or you can build a macro using SmartSet App. Tap the macro key to enter Program Macro Mode (lights will begin flashing rapidly). Select your trigger key with or without a modifier co-trigger (lights will lights will flash slowly). Then type your macro content on the keyboard and tap SmartSet when the macro is complete. Note: Every keystroke is recorded so if you make a mistake, we recommend restarting the macro or using the SmartSet App to edit it. Open the v-Drive (SmartSet + F8). Navigate to the “FS Pro” removable drive in File Explorer and launch either Windows or Mac version of the App. Select the desired key in App and the use the Macro Editor to type out your macro, customize the playback speed, and assign up to two co-triggers. Can I temporarily disable all my macros? Yes. Press and hold the SmartSet key and tap F9 (lights will flash), and then tap 0 to to disable (but not erase) all macros. To re-enable macro playback, repeat the command above. How should I clean my keyboard? Unplug the keyboard and remove all the individual keycaps to gain access to the keywells, which can collect lots of dirt after time. Use the included keycap removal tool and grab two sides of the keycap and pull straight up. If you do not have a keycap removal tool you can purchase one on Amazon or use two paperclips bent into the shape of a “J”. Soak the loose keycaps in warm soapy water lightly scrub to remove any gunk. Rinse the keycaps and let them thoroughly dry. Use compressed air to remove any loose debris in the key wells and use cotton swabs with rubbing alcohol to remove gunk. Use a microfiber cloth and a small amout rubbing alcohol to clean the outer plastic keyboard case. Do not reconnect the keyboard to your PC until it is thoroughly dry. If your Freestyle Pro is not working as expected, you have several options. Step 1: Reference the FAQs above and the Troubleshooting Tips at right. Step 2: Open any text editing program and use the onboard shortcut SmartSet + F7 to “print” a Status Report of the active keyboard settings to the screen. The Status Report will tell you the active layout and the number of remaps, and macros in that layout along. If Status Report indicates any inadvertent reprogramming, the fastest way to get help is to download and search the User Manual (linked above). Step 3: If your issue persists, we recommend installing the latest version of firmware (see below). Step 4: If you still need help, use the link at the bottom of the page to submit a Trouble Ticket. 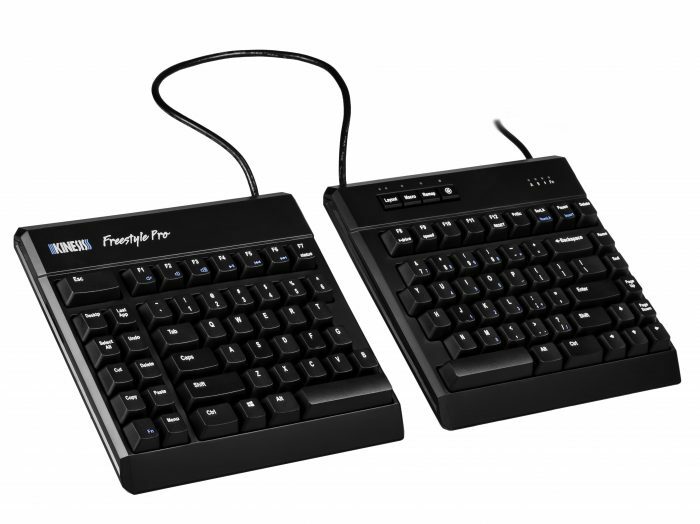 The Freestyle Pro uses a virtual removable drive on the keyboard to store custom layouts and settings. As with all removable drives, it is highly recommended to always use the “eject” feature in your operating system (in File Manager in Windows). In some cases it can be possible for the “v-Drive” to report errors. If the v-Drive can be opened, these can usually be fixed using the Windows “scan and repair” feature. Open file manager, right click on the v-drive and select “Properties,” then select “Tools,” then “Error Checking.” Click on the “Check” button. If “scan and repair” does not fix your v-Drive, you can reformat the drive using the command line interface on a Windows PC. The reformat will wipe the contents of the drive and restore the keyboard to its factory settings. Submit a Trouble Ticket below and a trained Kinesis agent will walk you through the reformat process. You can reset any key by remapping it to itself. 2. Tap the key you wish to reset twice. To erase a single macro, program an “empty” macro in the macro triggers place. Press the macro trigger keys. Tap the Macro key again to exit Program Macro Mode. Multimedia key actions reside in the embedded “Fn” layer. To access the media keys you must first tap the “Fn” key to activate the secondary key actions shown in blue. On certain machines and operating systems the default Status Report playback speed is too fast for the computer to process. To modify the playback speed use the shortcut SmartSet + Shift, then F7 (lights will flash). Then select the number 1 or 2 to set speeds 1 or 2. The Status Report can de disabled by selecting 0 or sped up by selecting 4. Note: You must replug the keyboard for this change to take effect. In some instances it is possible for a layout .txt file to become corrupted. If that happens you’ll need to delete the file and allow the keyboard to generate a replacement file automatically. Plug the keyboard in and test the Fn key. If the Fn LED illuminates that means the keyboard is getting power. If the Fn LED will not illuminate that means the keyboard is not getting power. First try plugging the keyboard in to a different USB port on the computer. If that doesn’t solve the problem, try a different computer if you have one available. If the keyboard still doesn’t power up, perform a Hard Reset by holding SmartSet, Shift and F9 while plugging the keyboard in. If a Hard Reset doesn’t solve the problem there may be a problem with an internal component so you will need to submit a Trouble Ticket. 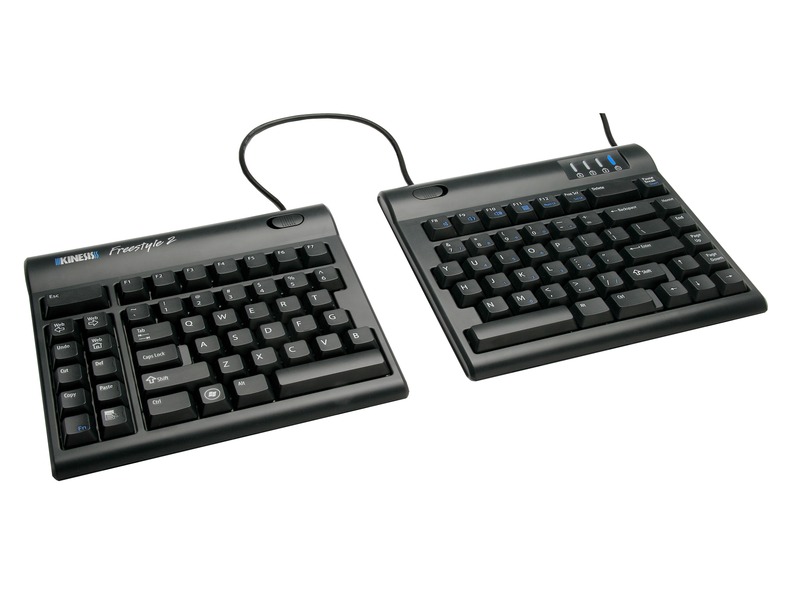 Because the Freestyle Pro is a multimedia keyboard that can present itself to the computer as a virtual flash drive, it may not be compatible with all KVM switches and docks. Unlike most keyboard programming software, the SmartSet App does not get installed on your PC. The App needs to be saved to the keyboard’s v-Drive and run directly from that location to access the various keyboard configuration files. If the App won’t launch, try deleting the App from the v-Drive and downloading a new copy and saving it to the v-Drive. If the App can’t access certain configuration files, delete the corrupted text files from the v-Drive and then replug the keyboard to regenerate new files. 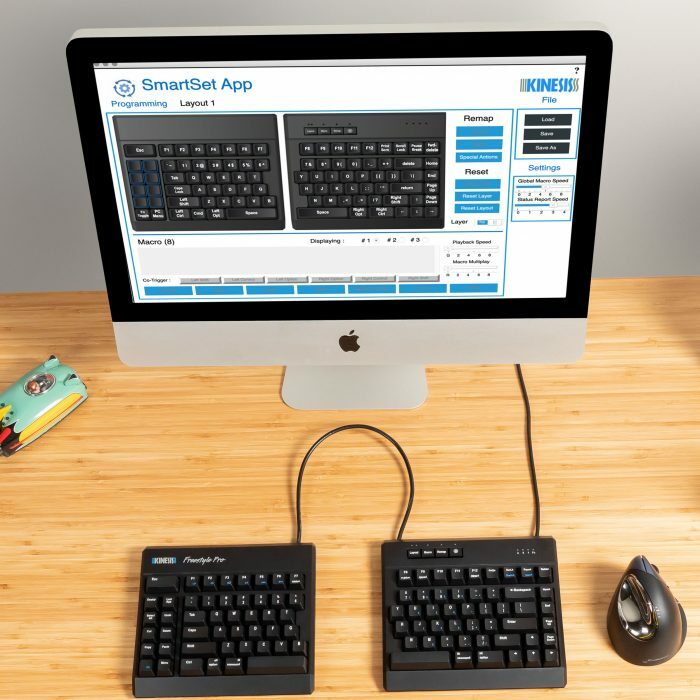 The SmartSet App offers a GUI alternative to onboard programming your Freestyle Pro keyboard. Windows and Mac versions of the App are pre-loaded on the Pro’s “v-Drive” and never get installed on your PC. To access the SmartSet App, simply open the v-Drive (SmartSet + F8). Navigate to the “FS Pro” removable drive in File Explorer or Finder and launch the appropriate version of the App. Save your changes, close the App, and then close the v-Drive to implement the new settings. Version 1.6.1 supports the new macro features found in the firmware update 1.0.340 (download below). Updating the firmware on the Freestyle Pro is a quick and easy process. Just download and save the new firmware file to the v-Drive, rename the file “updated.upd” and then use a simple onboard shortcut to install it. Download version 1.6.1 of the SmartSet App for Windows to access the new features.